This store is adjacent to the Angels in the Attic Store which is next door to the Floyd Country Store. 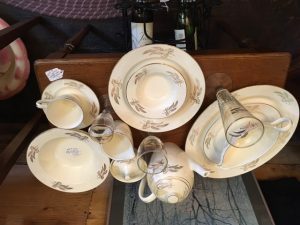 Rare set, in that they were Made in the USA by Lifetime China Company of Alliance Ohio c.1960s. Durable and long lasting Semi-Vitreous Porcelain and the name of the pattern is Prairie Gold. A set of a dozen flute glasses has been added to this set. So 79 porcelain pieces plus the 12 flutes. There is no metal border, so it is likely that these can be used to gently reheat food in the microwave and also likely they can be placed in the dishwasher. If you check on these on eBay you will find that they are pricey. On the website ETSY, a 37 piece set is currently priced at $185. Come on in and take a look and see what you think. At about $1.00 per piece this is a great buy.